A curvaceous rectangle resembling a barrel, a tonneau watch is a great alternative to the more commonly seen round shape. While admittedly not for everyone, it presents a more robust appeal and challenges designers to put a unique spin on traditional watchmaking. Here are some options that caught our attention. There’s nothing lightweight about RM 67-02, except for its weight. 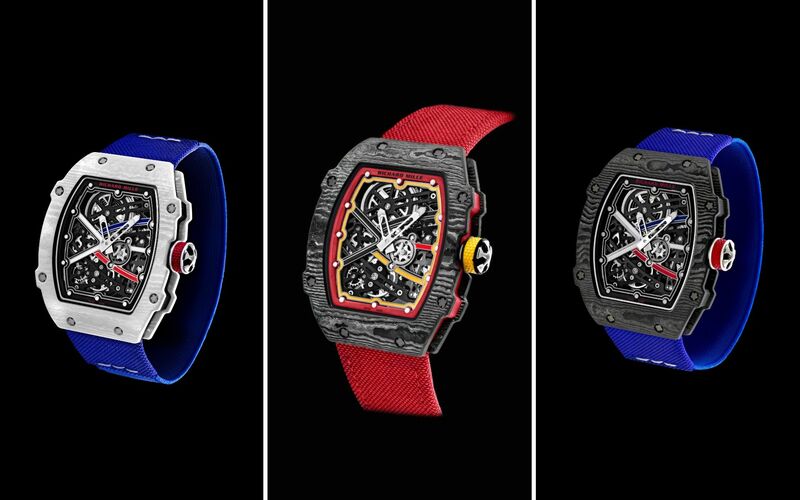 At 32g, it’s the lightest automatic watch from Richard Mille. However, the watch is engineered to withstand the harsh intensity on the sporting field, and in head-turning colours too. Four different sportsmen namely tennis pro Alexander Zverev, alpine ski racer Alexis Pinturault and World Rally champion Sébastien Ogier inspired the different renditions, each in colours related to their respective countries. The case is crafted in Carbon TPT or Quartz TPT while the dial is grade 5 titanium. For optimal comfort during a match or a race, the seamless strap is highly elastic that adapts to the individual contours of the wrist. Constructed in three parts, the tonneau case houses the innovative CVS-410 calibre that is endowed with a magnetic system with two small cylindrical magnets that creates no friction between the mechanical parts and thus improves efficiency. Winding performance is enhanced with an oscillating weight that is made of titanium grade 5 and Thungsten88, a combination that makes it steadier for better rotational acceleration. The movement can store up to 42 hours of power. The pictures really don't do it justice. We like how stunning it looks on the wrist, the openwork elements on the dial and large small seconds sub-dial complementing a case made up of a composite of titanium, ceramic and 5N rose gold. With its blend of purity and understated sophistication, Vacheron Constantin has a more classical approach with the Malte tonneau watch collection. Measuring 36.7mm across and 48.1mm in height, the 18k 5N pink gold case frames a sandblasted silver dial slightly domed to complement the curved dimensions of the case. The manual-winding Caliber 1410, powers a moon phase that only needs correcting once every 122 years. The indicator is positioned at ‘9’. Right above it, between ‘10’ and ’11’, is the power reserve indicator. Designed for the slender feminine wrist with a case dimension of 32mm x 42.3mm, Franck Muller has lavished the signature Cintree Curvex case with no less than 299 diamonds with an additional 41 diamonds around the moon phase. Endowed with an automatic movement magnificently finished with Cotes de Geneve, circular graining and hand chamfering, there are steel and 18k rose gold versions but we lean more heavily to the latter for its maximum luxe.